There is definitely something to be said about good bar food, but it is rare and hard to find. And once again a Madison bar’s bar food has disappointed me. I put a decent amount of stock into public polls like the Isthmus’ Madison Favorites and Madison Magazine’s Best of Madison list, but those voters led to astray this time. The Harmony Bar on Atwood Avenue has been recognized for best neighborhood bar and a couple other things over the years, but I definitely don’t agree. As far as dive bars go, this one is pretty high on the totem pole of dives I’ve been to lately. The building itself needs some updating and TLC to be anywhere near what I would consider a charming dive bar. The paint was peeling, the floors were dirty and I don’t even want to go into detail the disaster that was the bathroom. As for the food, they list “specialty pizzas” as a feature on their website. The picture on the website depicts a thin crust pizza with generous toppings and cheese. The pizzas we were served had super doughy and chewy crust, almost non-existent toppings, a sauce with zero flavor, and more grease than pizzas that are served out of cardboard box and cost $5. I barely ate the two small pieces I grabbed. Because the pizzas were so disappointing we decided to order some food off the regular menu. I am a Wisconsinite through and through so for me to leave cheese curds on the table when I leave, they have to be pretty bad. 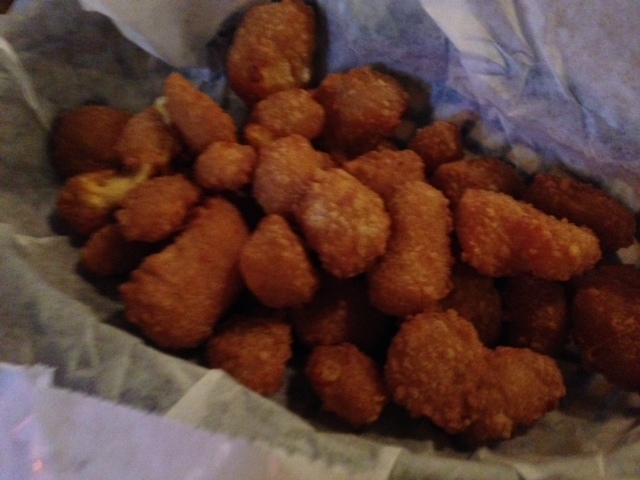 Not only did I not like the Harmony’s cheese curds, more than half of our order was left behind when we got up. The batter was super heavy, the curds were solid when they should be soft and stringy, and I can pretty much guarantee you they came out of a box from the freezer. The curds were extremely disappointing. Their pub chips and blue cheese were probably the best thing we had that night. 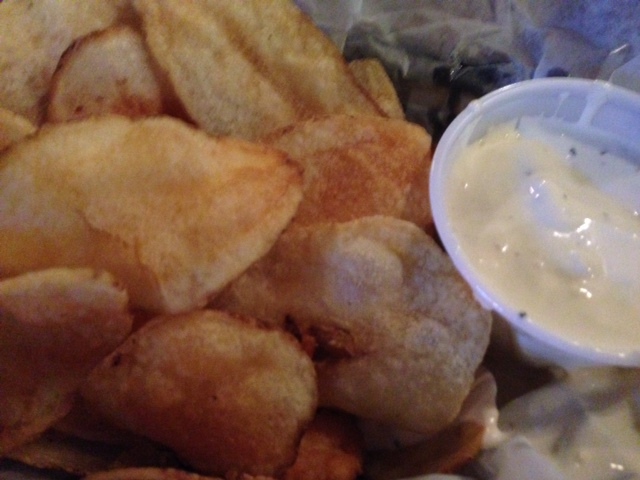 The chips were the perfect thickness with a good crunch, and tasted house made. The blue cheese dressing was so mild it could have passed as ranch, but it was still a good pairing with the salty, crispy potato chips. The burger was certainly nothing special. It was nowhere near as awful as the cheese curds, but I wished it was better. The cheese looked like it had been melted in a microwave, but the lettuce, tomato and onions on top were fresh. The one note I have about the burger is that it was huge. The actual patty was much larger than I was expecting. It didn’t have a ton of flavor or good char, but it wasn’t a terrible burger. FOOD NOTES: The Harmony has so much potential, but the building needs some TLC, and the kitchen and menu need to be revamped. The pub chips are the exception. They are perfectly thick and crisp, and aren’t too greasy. 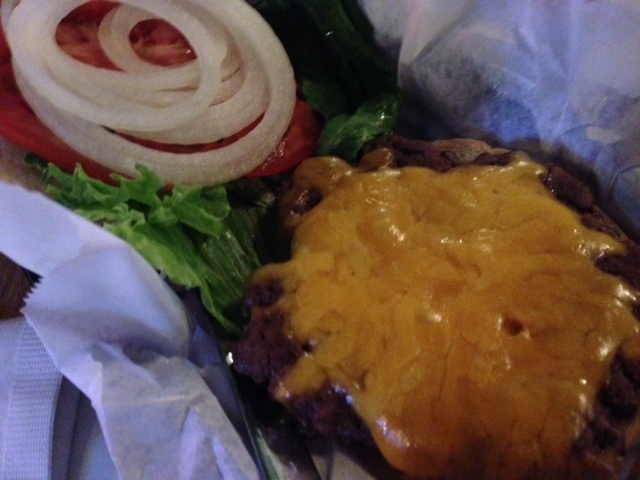 The cheese curds were laughable for a Wisconsin bar, but the burger was edible. I wouldn’t even bother with the horrible “specialty pizzas.” They do have live music some nights, so that might be a draw but I would suggest eating somewhere else before heading to the show. A couple of months ago I went to Alchemy specifically to try their sweet potato fries because I had heard they were great, but when I went they weren’t serving them because it was a Friday night. So recently I went back with a friend on a Saturday night specifically for the fries. 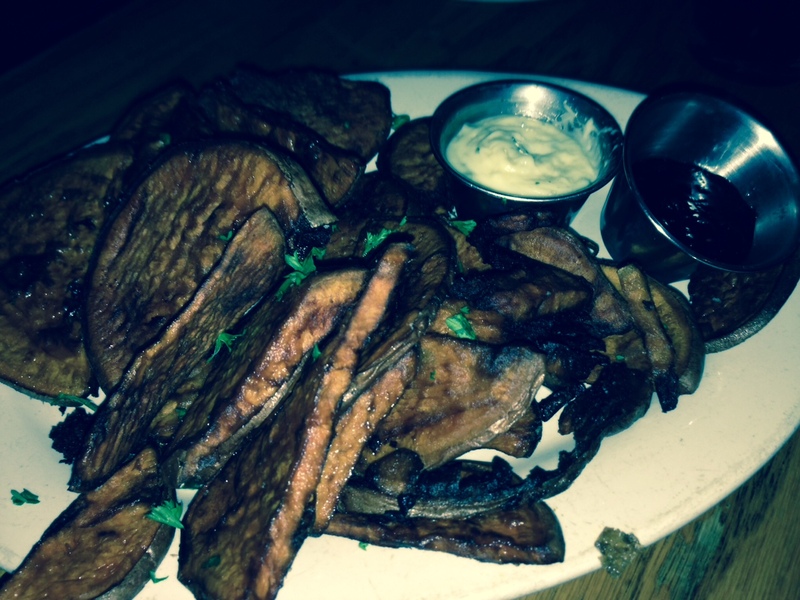 The menu says they are house-sliced, twice-fried sweet potato fries served with tarragon mayo and blackberry/jalapeno jam. The tarragon mayo was good, but I would have preferred a garlic mayo or maybe some seasoning on the actual fries that would have added some flavor. The jam was also a pretty big letdown. It didn’t really taste like jalapeno or blackberry, so it was basically a sweet dipping option. FOOD NOTES: The food I got during my first visit to the Alchemy was super great and I had high hopes for the popular sweet potato fries, but they were a disappointment. The fries were soggy, didn’t have any seasoning and were cut into over-sized chunks. The dipping sauces were bland and didn’t add anything to the flavor. When I get sweet potato fries I expect small, crispy, well seasoned fries served with a creamy garlic mayo or jalapeno jam that actually has a little spice; at Alchemy I didn’t get any of those things. 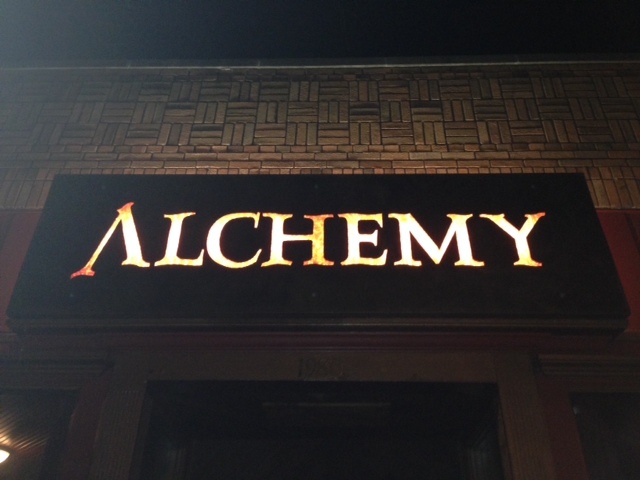 I have been trying to eat at the Alchemy at the north end of Atwood Avenue for a couple years now, but because they don’t take reservations the wait time was always 30 minutes or more, and during previous visits that didn’t work with our plans or our stomachs. This time, I decided I had waited long enough to try their lauded sweet potato fries so we waited the 30 minutes or so for a table. The restaurant itself is smaller than I think it should be, considering how long their wait times usually are, and it is extremely crowded with nowhere to wait for a table except directly in front of the door, in the main walkway for servers, basically on top of a full table or right next to the ATM. Oh yeah…they have an ATM in the restaurant because they only take cash. While I understand that credit card machines and fees are expensive, I think that in 2014 all businesses should take plastic, especially with so many options to take them via a smartphone or tablet. Usually a restaurant looses my business if they don’t take plastic, but we awkwardly waited by the ATM for our table anyways — luckily I had cash with me! I already knew I wanted to order the house-made sweet potato fries so when our menu didn’t have them listed I was super confused. When I asked the waitress she explained (in an annoyed tone) that they don’t serve the sweet potato fries after 5 p.m. on Fridays. What!?? How does that make any sense!? I’m assuming it’s because they use their sweet potato fryer to make their fish fry, but that little tidbit of information is not posted online anywhere, and it really doesn’t make any sense at all. Why can’t the sweet potato fries be fried in the same frier as normal fries, which we were able to readily get at 6:30 on a Friday night. Needless to say, I was very disappointed. The only thing that could make up for my extreme disappointment in Alchemy’s odd business decision regarding their sweet potato fries would be a great meal. Well, they delivered. I ordered the brisket sandwich and the picture I have doesn’t do it justice. The description of ingredients is what got me. It says the beer braised brisket from Black Earth Meets comes with mustard BBQ sauce, a house made pickled egg, swiss cheese, mixed greens and red onion. I love every single one of those ingredients and especially love pickled eggs. I know, they sound absolutely disgusting but they are actually really great. They are very popular at bars in Wisconsin, yet I have never seen one on a sandwich anywhere. The sandwich came with a couple of side options, but of course I went for the Alchemy fries in hopes that they might resemble the sweet potato fries. The Alchemy fries were large chunks of potato cooked to a perfectly fluffy consistency, and were seasoned perfectly. 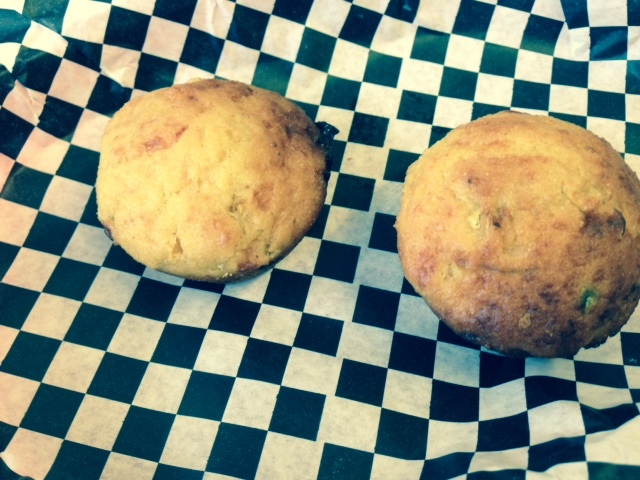 I’m not sure if they were baked or fried, but if they were fried they weren’t greasy at all. The sandwich itself was a huge success. 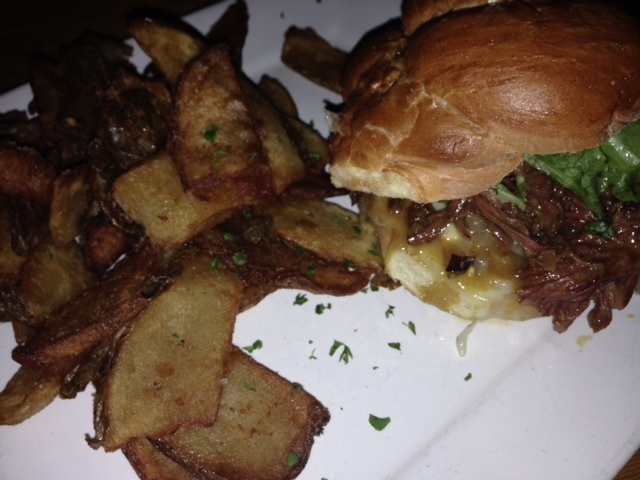 The soft, toasted bun could barely contain the serving of perfectly smokey and flavorful brisket on the sandwich. The mustard BBQ sauce helped cut through the heaviness of the brisket, but the real show-stopper of the sandwich was the sliced up pickled egg. That tangy, rich flavor really added a great contrasting flavor. The fresh greens and red onions added a much-needed freshness to the massive sandwich. I loved it. My one suggestion would be to add a bit more of the mustard BBQ sauce. 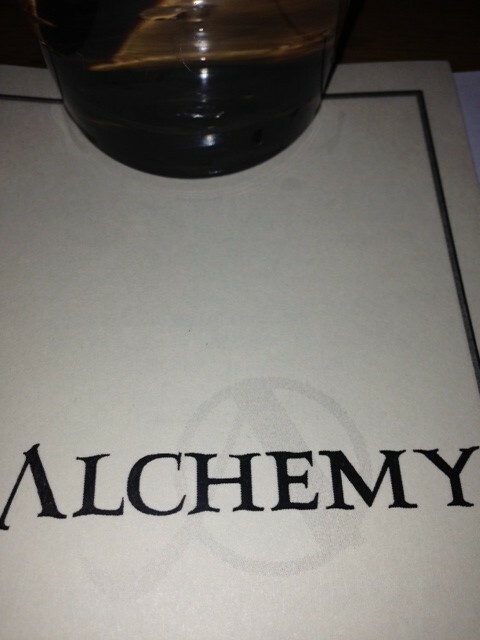 FOOD NOTES: Despite being very crowded and not taking reservations or credit cards, I loved my food at Alchemy. Their odd cessation of making sweet potato fries after 5 p.m. on Fridays really angered me, but the brisket sandwich made up for it very quickly. I’m going to say something bold: I haven’t had every sandwich in Madison, but the Alchemy’s brisket sandwich is the best one I’ve had so far and it is going to take a masterpiece to dethrone this sandwich. I will 100 percent be back for that sandwich, and one of these days I will get to try their sweet potato fries! 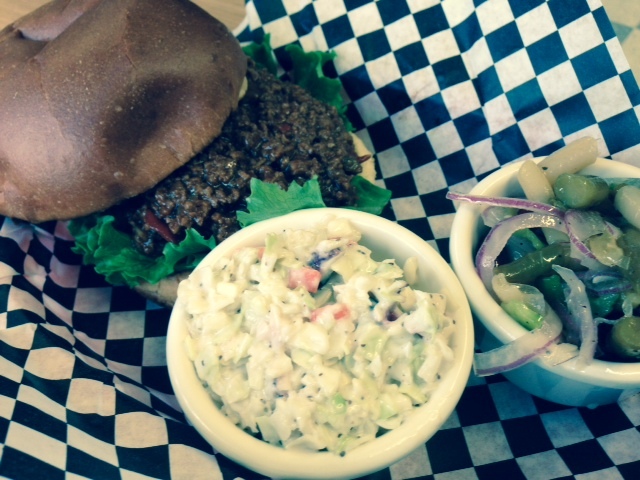 What do you think the best sandwich in Madison is? I’ve been to Stalzy’s on the near east side multiple times but this time their special was so good I decided I needed to post about it again! I’m not sure how to describe Stalzy’s other than say they serve fresh homemade deli food. I’ve had great soups and amazing sandwiches every time I’ve been there. And their beet salad is so epic that I took some home the last time I was there. 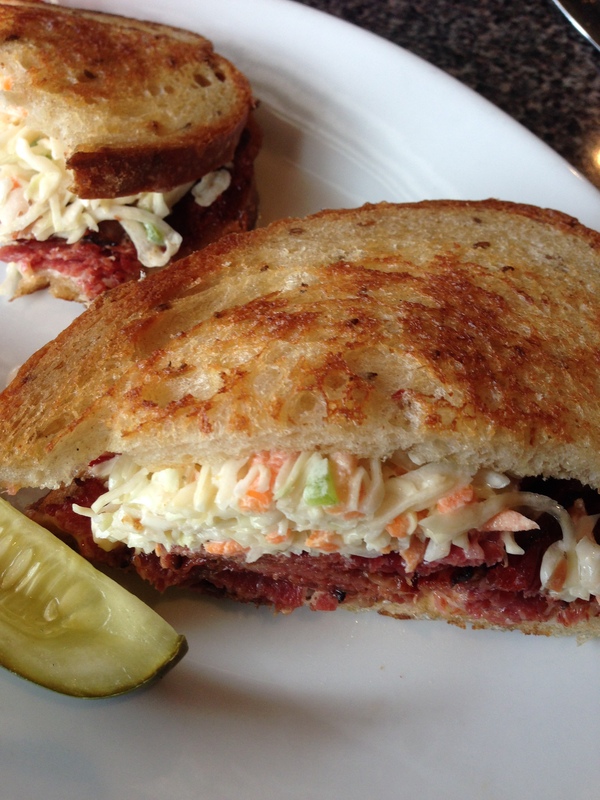 Usually when I go I get the Rachel with pastrami, swiss cheese, coleslaw and Russian dressing on rye. It is so good that I’ve had cravings for it. It is probably a good thing that I live on the completely opposite side of town. On my most recent visit their special was the Rachel with beef brisket instead of pastrami. I’m a huge brisket fan so I had to get it. 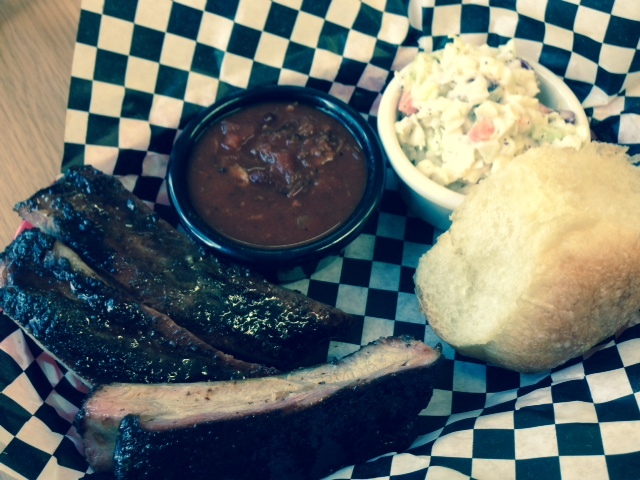 The brisket’s smokiness added another flavor profile to this already amazing sandwich. Also, by itself, the brisket was one of the best briskets I’ve ever had! My other go-to favorite at Stalzy’s is their beet salad. 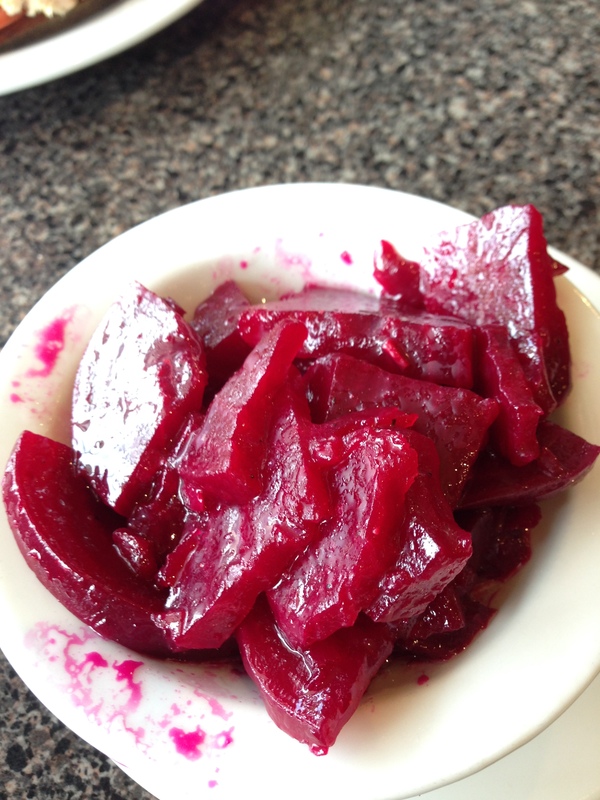 The beets are the perfect texture and have a good combo of spices on top of the pickling. They are an amazing compliment to the salty sandwiches at Stalzy’s. I haven’t tried any of their other sides because the beet salad is so good! 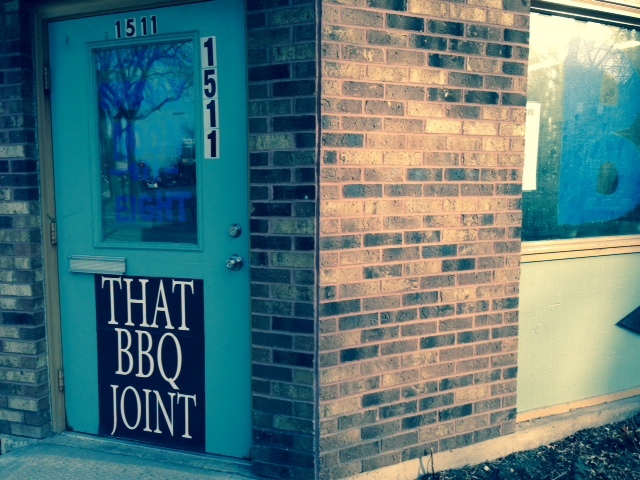 FOODNOTES: The special Rachel with brisket was the best sandwich I have ever had…ever! My goal is to visit Stalzy’s more often so I can try more of their sandwiches, sides and their brats/sausages. The one thing I will get every time I go is the beet salad. During this last visit I also found out they serve breakfast and really want to try that. They have a small deli counter and I would like to get some of the house-smoked meat at least once. FYI – they only take cash. A friend of mine got married Friday and the week before her nuptials we decided to have lunch. She is a bit chocolate and sweets fan so when I heard about this new cafe on the near east side I knew it would be perfect for us. I mean, it has chocolate in the name! 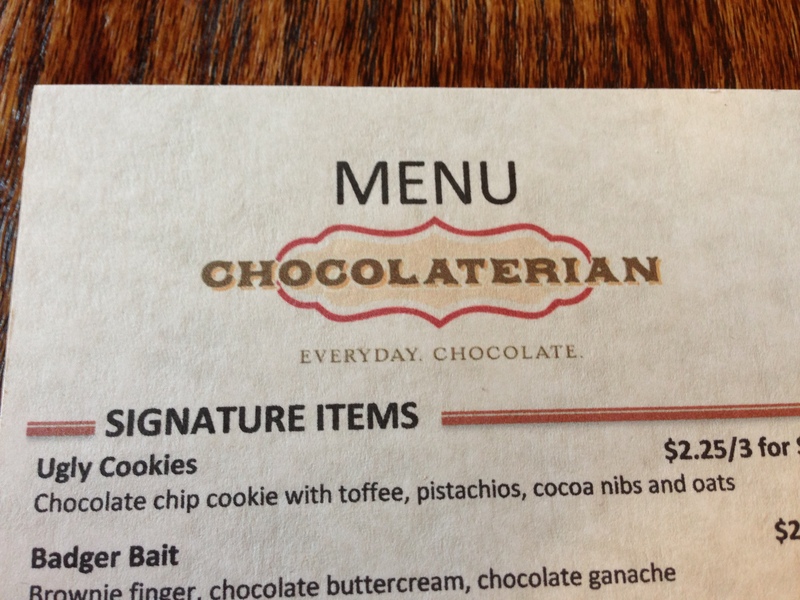 Chocolaterian Cafe opened almost a year ago at its Atwood location. I’ve been frequenting Atwood for a couple of years and I’m really glad the building at 2004 Atwood Avenue finally has tenants. It’s a really neat old building and the cafe definitely took advantage of the building’s features. There are two entrances (because the building is on a pointed corner), there are a bunch of neat built-ins, and the color choices were unique and appropriately fun. The decor was modest but fun with the main wall behind the bakery counter filled with antique chocolate molds. 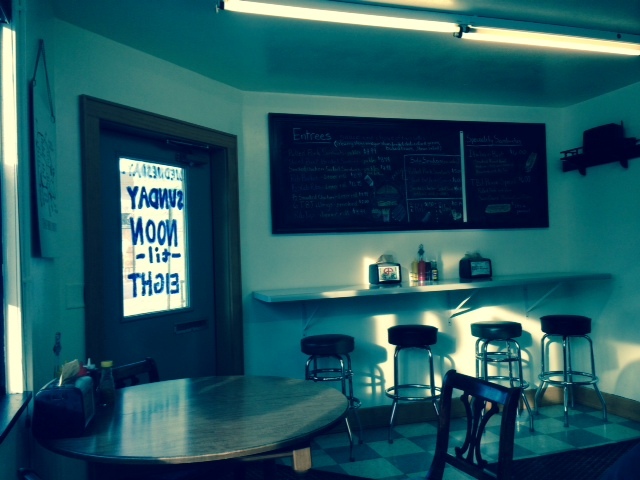 The cafe features bakery items but also offers lunch items. There are regular items that frequent the bakery case and daily specials. Recently I’ve been obsessed with french macaroons so when I saw them in the display I knew I had to get them. They had a decent amount of flavor options and for $5 you got three. That’s a pretty regular price but the size of the macaroons was smaller than normal. I got the lemon vanilla, raspberry and pistachio. All three were very tasty! 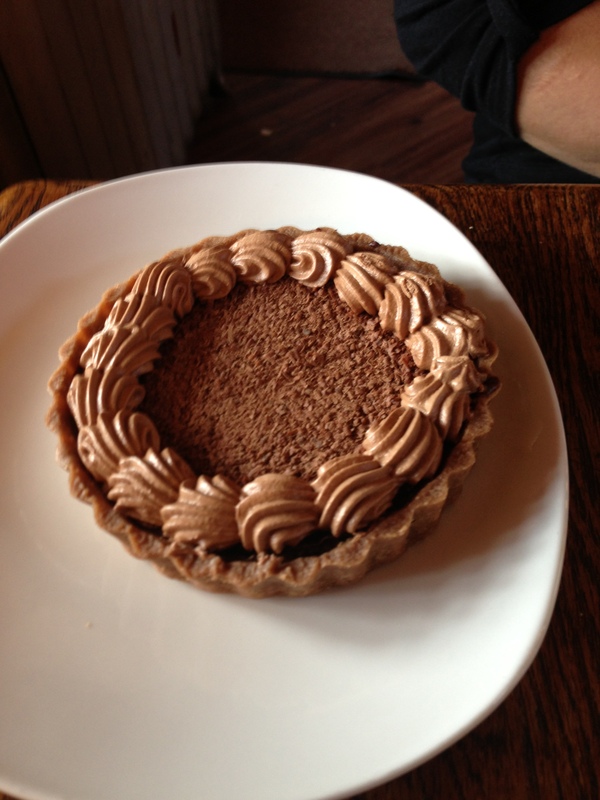 My friend got a chocolate tart that I’m pretty sure she loved because it was 100% dense chocolate. She did recommend they edge the top of the tart with fresh whipped cream instead of chocolate cream to make it a little less rich. The bakery case was filled with two other flavors of tarts, a half dozen different types of cookies, and a couple other decadent desserts. The also had fondue on the menu! 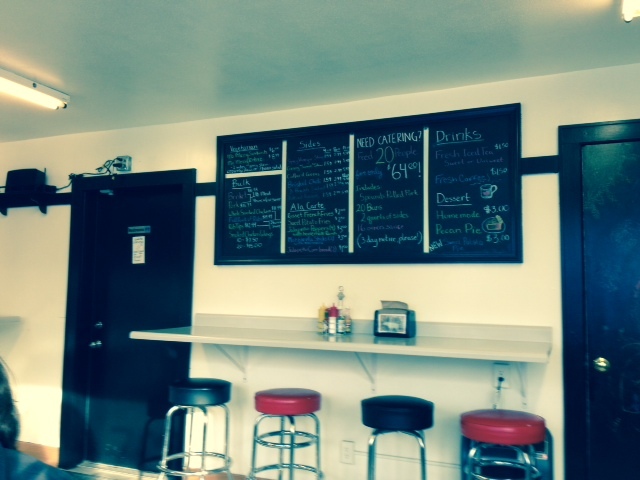 They offer two types of quiche and paninis daily as well as a cheese plate, soups and salads. 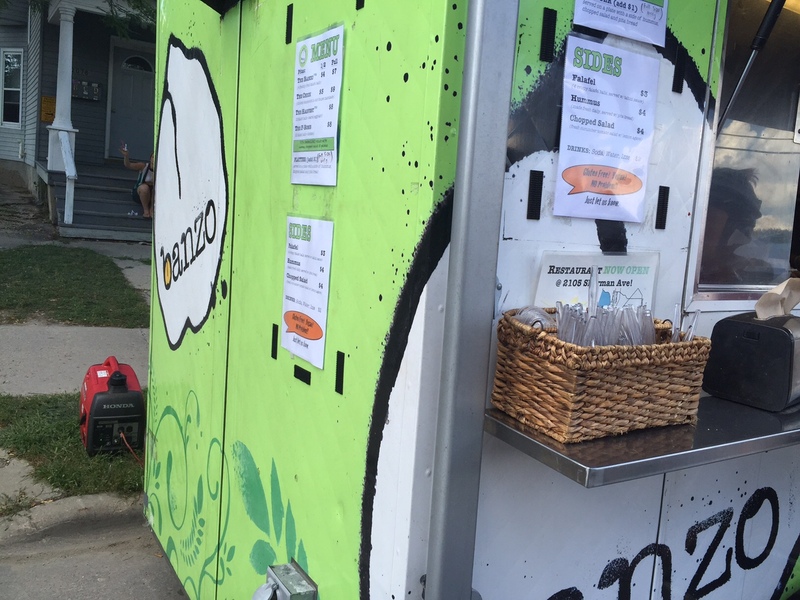 They also offered regular coffee and tea options. I got the grilled chicken Caesar salad. It was very fresh and there was the perfect amount of dressing on top. It came with a full chicken breast but I was a little disappointed in the size of the total salad for the price (it was $8.50 for a small plate a lettuce, a couple tomatoes, and the chicken). My friend got the cheese plate, which came with three Wisconsin cheeses, crackers and jam. The odd thing about the cheese plate is that it didn’t say on the menu or the plate what type of cheeses they were. She enjoyed the cheese plate and that’s probably what I’ll get next time I go. That is if I’m not interested in the panini or quiche combinations again. 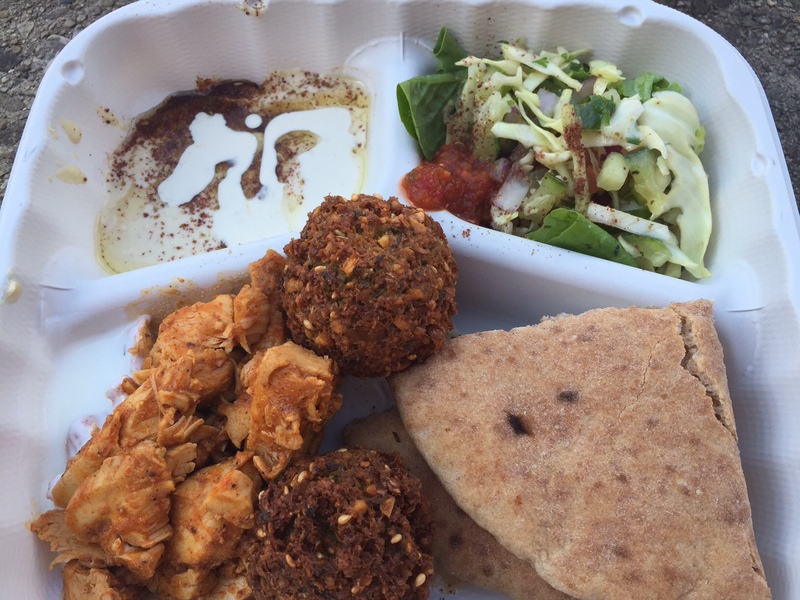 FOODNOTES: The location is great and the decor/ambiance is even better! 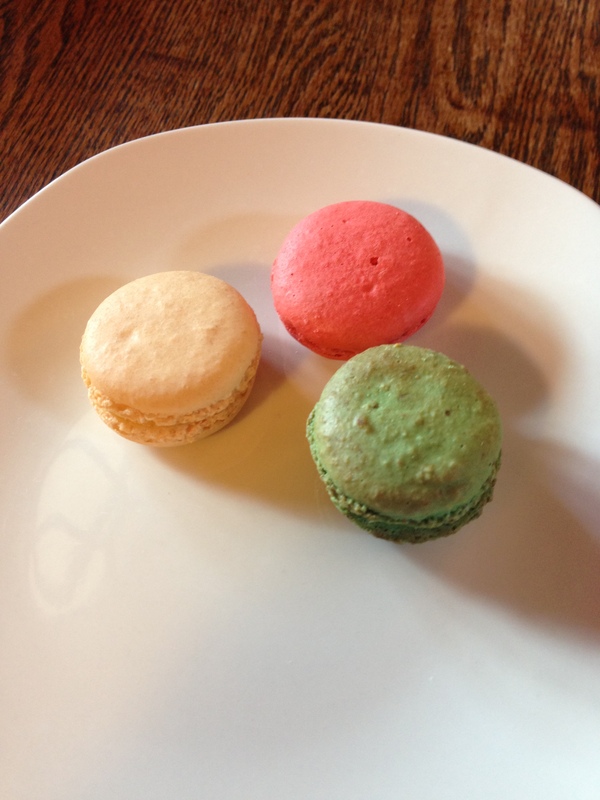 The macaroons were good but could have been larger. Ditto for my salad. The cheese plate needs labels but was very impressive. I definitely plan to go back for coffee and baked goods (and will hopefully bring some home)!